Delta Uses Microsoft to Transform Flight Operations and the Customer Experience | Constellation Research Inc. In 2013, Delta Air Lines sought to reduce the amount of paperwork the pilots carry in their flight bags by implementing an enterprise managed tablet system. The average flight bag contained thirty-eight pounds of paperwork. Multiplied over thousands of flights, the paper in the pilot flight bag represented a loss in fuel costs, emissions, convenience and customer safety and experience. The transition from paper to tablets reduced the number of pounds of paper on flights, thereby affecting the overall carbon footprint as well as providing better customer safety and customer experience. Pilots needed an electronic solution that not only reduced the weight of the flight bag, but also put critical information at the pilot’s fingertips via an electronic tablet, which can enhance the pilot’s situational awareness and improve customer safety and hence the overall customer experience with the airline. These requirements meant the solution needed to be compatible with Delta's technology systems and have the ability to run Jeppesen’s FliteDeck Pro. 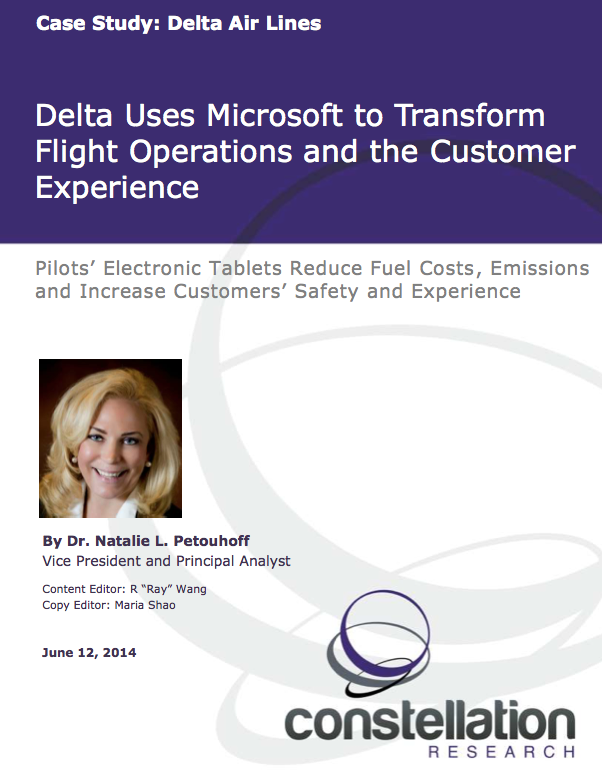 This case study examines why Delta Air Lines chose the Microsoft Surface 2 as their digital paperwork solution, how Delta implemented the devices, and the ROI of the project. Is Your Supply Chain Ready for the Internet of Things?